Getting ready for the arrival of your upcoming baby can be a pretty hectic experience. There’s a lot to do! Attending appointments, choosing a name, buying clothes and nappies, the list goes on and on. But there are fun parts to it too. One of the most enjoyable parts is the planning and decorating of your baby’s nursery. It can help you feel more prepared for your baby and help you bond whilst you create a space just for them. Once you have the furniture sorted and picked the color scheme, you can move on to the exciting part: the wall decor and accessorizing. For those soon-to-be-parents who’re a little more on the creative side, why not try out some DIY wall decor? 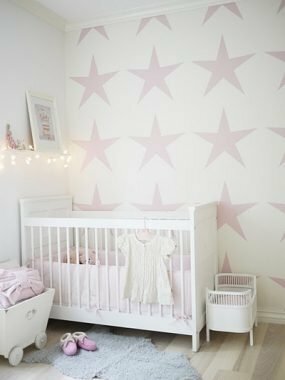 We’ve put together a list of ten DIY wall decor ideas for your baby’s nursery that can help save you money and make their room completely unique. Children’s books are filled with bright images that kids love. Display the illustrations from a classic children’s book in frames on their wall. You could either show the full tale in a series, pick the key scenes or pictures from several different books. Choose a classic tale like Where the Wild Things Are, Little Red Riding Hood, Winnie the Pooh or The Tale of Peter Rabbit. To keep the cost low, pick up some cheap books for your literary wall prints from charity shops or yard sales. It doesn’t matter about the quality of the cover, just ensure the image inside the book is a good quality for your wall. If you’re just displaying one full story, remember that you’ll need two copies of the book if pages are printed front and back. 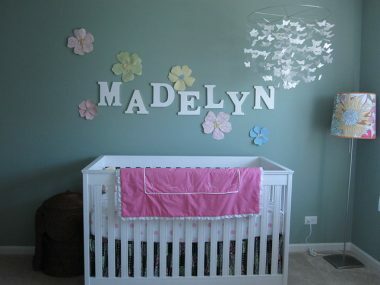 A simple and effective type of wall art is to add bright and colorful letters to your nursery. Spell out your new baby’s name, their initials or add the full alphabet if you have enough space. Letters can be displayed in colorful frames or applied directly to the wall if a cardboard backing is used. Depending on how crafty you’re feeling, you could write out and decorate each letter by hand or print out the letters and apply them to bright paper. For a unique effect, use different fonts and sizes for each letter, especially if you’re creating an alphabet. Like with the storybook, you can use secondhand frames to keep your cost low. It’s amazing how quickly your child will grow. Combine the old tradition of tracking their height with an adorable type of wall decor by creating your very own growth tracker. The best way to create a growth chart is by using a piece of wood that is applied directly to the wall. You can remove the chart when your child gets too old but keep it as a memento from their childhood years. Growth chart designs are completely up to you. 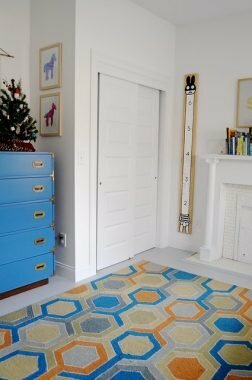 Either keep it classic with a plain ruler to mark their height or go for something bright and colorful. A great idea is to add pictures of your child whenever you mark their height on the chart. Then, you’ll be able to see their height increasing as well as how their appearance changes over the years. 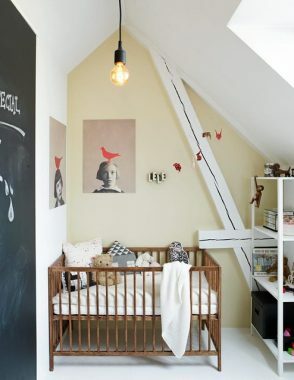 Whether you’re an artist or not, anyone can paint basic designs on a nursery wall. If you are skillful with a paintbrush, add some freehand shapes or basic illustrations. Hot air balloons, clouds, rainbows and flowers are easy ideas to paint. If you’re not comfortable painting freehand, buy or make shape templates. Paint shapes in bright and eye-catching colors for a basic but effective design. Alternately, you could paint a simple polka dot wall really easily. If you want to add a unique design to your baby’s nursery wall that’s a little less permanent than paint, using colored tape may be a good option for you. You can use tape to create shapes, wite-out words or create basic symbols like crosses or arrows. Tape is useful as it can be removed without damaging your wall if you make any mistakes or when you’re refreshing the decor as your child gets older. 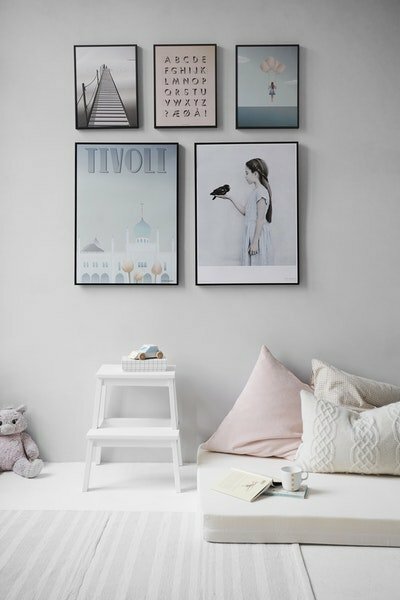 Although you won’t be able to do this until your child is slightly older, displaying your children’s artwork is an inspiring way to decorate their space. Frame any art they create, from finger paintings to drawings. Not only will it give the room a distinctive personality, but it can also help your child feel valued and supported. This will help to give them more motivation to be creative. Not only do chalkboard walls have a great look, but they also have a lot of different functions. You can draw pictures, write reminders for yourself and more. When your child gets a little older, they can draw on the chalkboard. It’s like having a giant blank canvas in their room that can constantly be changed. Whilst children are young, only let them use the chalkboard when supervised and keep the chalk out of reach. To get the chalkboard effect, use a chalkboard paint on the wall. You can also use it on furniture if you’d prefer. Creating a garden themed nursery is super easy. All you need is a white picket fence, some green and blue paint and fake flowers or paint if you would prefer. On the wall, use a pencil to draw a downward facing semi-circle to create a hill. Paint this green and the wall above it blue. Then, mount your white picket fence to the bottom of the wall and add the flowers on the grass. 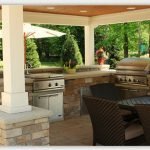 If you’re more creative, feel free to add to the design to make it more exciting, however, the basic garden looks amazing by itself. Bunting is a traditional form of party decor that works really well as a feature in a nursery. You can create bunting using fabric offcuts, craft paper or bright plastic with a piece of thin ribbon or string. Cut out identical triangles from your chosen material. You’ll need an even number and the right amount for your wall. Once you have all your triangles, stick or sew them together leaving the top half free. Put the triangle in place on the ribbon and use the top edge to stick or sew them in place. Bright patterns and bold designs for your flags will add a pop of color to the nursery and look fabulous. Triangles are the traditional shape for bunting, however, you can use other shapes if you’re feeling more experimental. Just make sure there’s a flat edge to attach them to your string or ribbon. Wall hangings come in all different shapes and sizes. This makes them the perfect wall decor for someone looking to express their creative side. You can use a piece of material or wood for the bracket. Then, tie hanging fabric to the bracket. Use strips of material, wool, yarn or whatever else you think looks good. Just keep it bright or in the color-theme of the rest of the nursery. Wall hangings are pretty subjective so have fun and add whatever you think works. Although this is a DIY idea, you’ll need some help to achieve the final results. Using a computer, create a collage of family pictures. You could include sonograms, pregnancy photos and photos of different family members. Once you’ve created your photo collage, create a custom wall mural for a wall in your nursery. A wall mural is easy to install and works well to create a feature wall in your baby’s nursery. 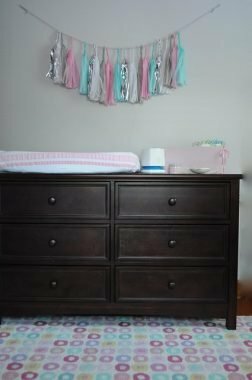 Decorating your baby’s nursery doesn’t need to be expensive. Creating DIY wall decor will save you money and give your room more character. Get creative when it comes to nursery decor but avoid cluttering the walls. Try to create a balance between a relaxing place for your baby to sleep and an engaging area for your baby to play in. David Atkinson is a content creator at Azutura , a leading manufacturer of wall murals. He lives in the UK with his wife and Shih Tzu/Pomeranian cross.